Huawei has done it again, creating the camera phone to beat. The Huawei P30 Pro is the camera phone to beat. It surpasses all other rivals in imaging prowess, with fantastic low-light performance and zooming capabilities. Aside from some minor niggles, and a rather high price tag, this is a superb device. The Huawei P30 Pro is here and boy does it have a lot to live up to. Huawei shifted the world’s perception that phones can (shock, horror) take fantastic pictures, with the P20 Pro. Soon after, the entire phone market shifted focus and conceded that the camera was the next big spec race. Now Huawei has to prove that it can challenge once again in what has become a very crowded space. When Huawei first linked up with Leica to deliver its phone lenses, eyebrows were raised - you don’t go into partnership with the likes of Leica without intending to create a camera phone with quality. It is a strategy that has paid off, though, as we saw with the Huawei P20 Pro and the Huawei Mate 20 Pro, the Chinese phone giant has managed to match optics with market-leading sensors and software. But, the iPhone XS, Google Pixel 3 and Samsung Galaxy S10 have all entered this market with brilliant camera offerings. A year is a long time when you have rivals this good, so what does the Huawei P30 Pro actually deliver for photographers? The Huawei P30 Pro is an intriguing beast when it comes to specs. It’s a handset that manages to mix 'mind blowing' with 'meh'. The 'mind blowing' first: the phone houses four cameras on the back of its chassis. A 40MP (Wide Angle Lens, f/1.6, OIS), 20MP (Ultra Wide Angle Lens, f/2.2), 8MP (Telephoto, f/3.4, OIS) and a time-of-flight camera for better depth perception. Atop of these specs is its zoom capabilities. Huawei has managed to squeeze a 5x optical zoom in, which manages 10x with some hybrid AI goodness. It can also go all the way up to 50x but that relies on digital rather than optics. It’s an impressive camera haul but eagle-eyed readers will note that megapixel-wise this is the same as the P20 Pro. But the maximum aperture on the main 40MP camera has been improved from f/1.8 to f/1.6. Possibly the biggest - yet least obvious - camera upgrade over the P20 Pro is the new RYYB sensor in the main camera. The use of red-yellow-yellow-blue photocells on the sensor surface rather than the traditional red-green-green-blue 'Bayer' array is said to offer a whopping 40 percent higher light sensitivity over the P20 Pro, as yellow lets in more light than green. But this simple-sounding change has required all of Huawei's engineering expertise to implement. What the P30 Pro doesn’t have is a monochrome sensor. This has been replaced in favour of the 20MP, 16mm-equivalent, f/2.2 ultra-wide camera. Still, there will be many mourning the loss of the monochrome sensor. In our tests the B&W shots we took were decent. Monochrome mode is decent but we do miss the monochrome lens. On the front of the Huawei P30 Pro there is a dewdrop notch (housing an impressive 32MP selfie camera) and a 2240x1080 OLED screen. It’s now 6.47 inches, compared to the P20 Pro’s 6.1-inches but we can’t help be disappointed by that pixel count. This is where the 'meh' comes in: Samsung Galaxy S10 (and 10+) has a brilliant 3040x1440 pixel count (550 ppi), the iPhone XS has 2688x1242 (458 ppi). At 398 ppi, the P30 Pro’s screen seems disappointing on paper, especially when you compare it to its stablemate, the Mate 20 Pro which has a 6.39-inch screen and 538 ppi. However, with fewer pixels to power, battery life is potentially increased - Huawei is claiming the 4200mAh P30 Pro can last two days of moderate use, and a whole day of heavy use. In our tests, it lasted the whole day and then some. What's more, even at 'only' 398 ppi, it's not like you'll be spotting any individual pixels with the naked eye any time soon. There's some nice detail in the brickwork and water. The handset we reviewed had 8GB of Ram, made use of the Kirin 980 chip (as seen in the Mate 20 Pro) and had 256GB of storage - more than enough to keep your images on the device, if you’d rather not use cloud storage, such as Google Photos. When it comes to size and weight, the P30 Pro is a little thinner than the Mate 20 Pro (at 8.41mm, compared to 8.6 mm) but a touch heavier (192 grams, compared to 189 grams). Against the P20 Pro it’s chunkier and heavier (P20 Pro is 7.8mm in depth and 180 grams in weight). Given the larger screen, however, all is forgiven. Like the P20 Pro, the lenses do protrude from the back of the device - it’s a noticeable lip that can be felt in the pocket. Our biggest concern was damaging or scratching them, so we would certainly invest in some sort of case. If you are one of the lucky ones, then a silicon case is included in the box, as is a fast charger (40w which can juice up the phone in mere minutes, you can also charge it wirelessly) and some USB-C headphones. Performance-wise, the P30 Pro is up there with the blistering best. This RAM bump is certainly welcomed. It meant we flipped through menu screens like a knife through melted butter. From home screen to camera app, it’s a blink of an eye, and it’s nice to see the camera options in the camera app streamlined for in EMUI 9.1 (Huawei’s software that’s layered over Android 9). There's a nice nuance in colours, even on an overcast day. When we say streamlined, we don’t mean that Huawei has taken any features away, but just presented them in a better way. AI is now easier to turn on and off, and isn’t buried in the settings. HDR is now an optional feature in the More section of the app (which will please those who aren’t fans), while Macro mode gets its own dedicated section. Macro gets its own dedicated mode on the P30 Pro. We took hundreds of images with the P30 Pro and it is a brilliant camera phone - the best we have tried. As with the P20 Pro, the manual options available are plentiful, the auto mode fantastic. Having a quad camera setup means that you have myriad of lenses to choose from when taking images. As you can see in the shots below, when you flip from normal shooting (which is 10MP, unless you push it up to 40MP manually) to the 16mm wide-angle lens you can see that so much more is captured in the image. In our images of Little Venice in London, a whole new path appeared. We also liked that Huawei seems to have toned down its sharpening. Many of the images we took were on an overcast day, but there was still lots of clarity without looking like Huawei had gone crazy with the HDR mode. There is the option to do this yourself, but we didn't notice a huge difference with the mode on. This image of pigeons was taken with HDR mode on. Yes, there's detail but it's more subtle than the Mate 20 Pro. One of the standout features here is certainly the 5x optical zoom. As you can see in our shot of the standing model, the flick from normal to 5x offers up a decent bit of clarity. It's certainly the best zoom we have tried on a phone. Push it to 10x, though, and sharpness dulls a little and at 20x artefacts appear. With a steady hand you can go up to 50x zoom - it's fun to get that close up to something from so far away but the quality is not that great. We tried it again in our shot of the London Eye and the 50x zoom manages to pick out people in one of the capsules. Yes, they are blurry but to get anything close to a normal image from that far away is pretty jaw dropping. Grainy but impressive nonetheless. We did find that the jump from 1x zoom to 5x is quite jarring - the Huawei P30 Pro misses out the 3x zoom that can be found on the Mate 20 Pro, we would have liked to have seen this included as well as the 5x zoom. Another stand out feature is the P30 Pro's night shooting. We never thought this would happen, but Huawei has managed to surpass the might of the Google Pixel 3 when it comes to night shooting. The images it can get in darkness are fantastic. Even better (although a little confusing) is the fact that the P30 Pro can handle night shooting effortlessly in its normal shooting mode. As you can see from our shots, there is very little between the night mode and normal mode. This is outstanding, given in night mode there was a five second exposure, while in normal mode the ISO is doubled and there was no waiting on the exposure. The Pixel 3 in comparison does a decent job with the shot but there's an over saturation there that isn't found in the P30 Pro's shots. 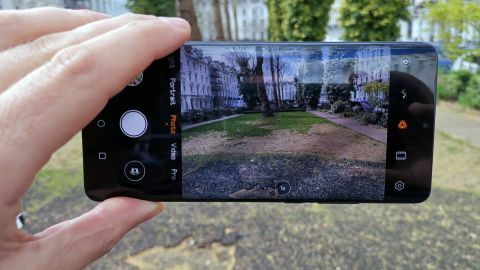 The Pro mode on the P30 Pro is once again a playground for photographers but it did frustrate us a little. Rendering of shots didn't seem to be as good as the auto mode that's available, and ISO is severely reduced in Pro mode. Where you can go all the way up to ISO 409,600 (crazy) in normal mode, this is kept to 6,400 in Pro mode. A lot more tinkering, however, and we did have fun with the mode. The ability to change shutter speed and white balance does mean that with careful tweaking you can create some pretty special results. Perhaps the best manual control we found on the P30 Pro, however, was in Aperture mode. The ToF sensor is the magical fourth camera on the handset and it's the one that adds sophisticated depth perception to the phone. The depth perception on the P30 Pro is superb, thanks to the ToG sensor. You can see this in Aperture mode, where you can manually slide up and down the f stops (f2.2 to f0.95). The results are superb, as you can see in this shot of the model's face. Portrait mode is a more automatic version of aperture mode - both modes treat hair much better than the Mate 20 Pro did, and we can only put this down to the ToF sensor doing its thing. The bokeh effect also works well with the front-facing camera (minus the ToF). Bokeh is improved, even on the front-facing camera. The Huawei P30 Pro is a superb camera phone. We would even go as far as saying, it's the best camera phone you can buy right now. But there are caveats: this is a phone that uses the same processor as the Mate 20 Pro, has camera lenses with identical megapixels on them and comes with an inferior screen. But, it offers best-in-class zooming, best-in-class low-light photography and some of the best bokeh we have seen, thanks to the additional ToF lens. This is Huawei in an in-between stage. We have no doubt, with what we have seen here, that if the next Huawei phone that comes out, with a new chipset and better screen and some new camera tricks it will be a 5-star phone. As a pure camera phone, there is nothing better than the P30 Pro out there right now.